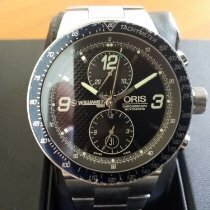 Oris chronograph watch from Oris TT1 Collection. 100m Water resistant. 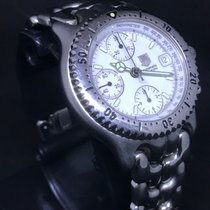 Swiss ETA Valjoux 7750 Automatic chronograph movement, satin finished stainless steel case, screw-down crown and case back, black dial with date calendar, skeleton case back, satin and polish finished stainless steel watch bracelet.